The Catfish Farm is an assemblage of tracts that were historically used for agricultural and silvicultural purposes. Located on the peninsula of land just north of the juncture of the Great Peedee and Little Peedee Rivers, The Catfish Farm is within a low lying area known locally as Terrell's Bay. Historically, many of the low lying areas in the Peedee region of South Carolina were ditched, drained and farmed. The Catfish Farm tracts contain some wetlands and streams that have been heavily impacted by these practices for 60 or more years. USGS Aerial Photography, old plats and topographic maps, and extensive studies that have been conducted on the property indicate that the relic channels of several streams, and hundreds of acres of wetlands that have been lost or heavily impacted due to these practices. The future of the Catfish Farm will look much like its distant past. The current owners are in the process of permitting and constructing a wetland and stream restoration and preservation project that will restore the aquatic resources on the property to their natural state and preserve them in a perpetual conservation easement to be monitored and enforced by the U.S. Government. The easement will basically preclude all manipulation of the area it encompasses and return that area to it's wild and natural condition. The owners believe that the restoration of these resources will greatly enhance the wildlife management and recreational characteristics of the property. Approximately two thirds of the 1850 acres of the Catfish Farm will be preserved in this manner, while approximately one third of the property will remain in use for agriculture, silviculture and active wildlife management. Still eyeing those who gulp the marsh foul." These mixed emotions about wetlands even color our language. We get "bogged down" or “mired” in our work when can't make any headway. When we have too much to do, we say that we are "swamped". The word "swamp" shares a common origin with the word "sump", which is a hole or pit where you dump nasty things you don't want to deal with, like a cesspool. The word "bogeyman" may be derived from the word "bog". Swamp Thing, featured in Marvel Comics and cartoons, is a cultural icon born out of this conflict. Trapped in the body of a shambling monster, forced to live in the darkest recesses of the swamp, he fights against the forces of evil before slinking back to his dark sanctuary. But wetlands are economically and ecologically valuable in many ways. Wetlands support an abundance of life. 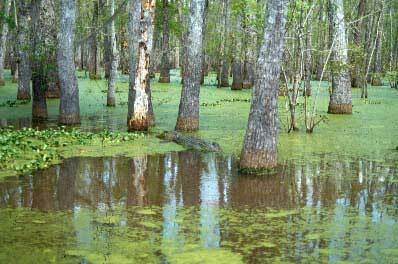 Many plants, like cypress and tupelo trees, are specifically adapted to wetland habitats. There are relatively few vertebrates, however, that can survive in this habitat, although several species spend at least part of their lives in swamps. Some fish, like gar and bowfin, are permanent swamp residents. The most common species in stillwater swamps are fish that can gulp oxygen by sticking their heads out of the water, fish like the mosquitofish (Gambusia), and fish that can otherwise tolerate low oxygen levels. Many other species of fish use the swamp as a nursery for juvenile fish, or move into swamps to feed during periods of high water levels. Unlike other vertebrates, reptiles andamphibians are superbly adapted for life in the swamp. Alligators, cottonmouths and other snakes, lizards like the skink, and lots and lots of frogs live in the swamp. Birds are also important members of the swamp community. Predators like the Barred Owl, or the Marsh Hawk or Red-Tailed Hawk, are commonly seen flying through the swamp. Several passerine species (perching birds) can be found in the swamp, birds like warblers, woodpeckers, and wrens. Wading birds, ducks, and other waterbirds are specifically adapted to a wetlands environment. Wading birds commonly locate their huge nesting colonies in the swamp, where many potential predators can't reach them. Their biggest predators are snakes and fish crows, to whom the water is not an obstacle. Other predators, like raccoons, can only reach the colony during extended droughts. And when they do get in, they do a lot of damage. Raccoons can't live in the swamp itself, but haunt the edges of swamps, taking whatever food they can find, taking advantage of low water to hunt deeper in the swamp. In addition to providing valuable habitat for numerous species, freshwater wetlands also act as filters to remove excess nutrients and toxic pollutants from the water. They are tremendous filters for human sewage, toxic metals, and other types of pollutants. Wetlands also buffer coastal areas against wind and waves, and hold excess floodwater to help protect towns and cities during hurricanes and heavy rains. Wetlands are of tremendous economic value, yielding timber, furs, crawfish, shrimp, and fish. Many commercial species live in wetlands or use them as nursery areas. Ecotourism is also a booming business in our swamps. Above and beyond these practical considerations, however, wetlands are aesthetically valuable, and deserve protection in their own right as beautiful natural areas. Our ignorance of their true value is reflected in the statistics of their destruction. In America, over half of our native wetlands are gone. From around 220 million acres in "the lower 48" in colonial times, we have reduced wetlands to about 104 million acres, a 53% loss." Within this property, there are cypress-tupelo swamps to explore. These unique areas have microtopography that is often pronounced with small channels, swales, tree-base hummocks, and numerous bald cypress "knees." Overstory composition varies from mixed stands of bald cypress (Taxodium distichum), water tupelo (Nyssa aquatica), and/or swamp tupelo (Nyssa biflora) to nearly pure stands of one species or another.